According to investors' demands, the facility of the Visitor Center is designed as a multifunctional space in which the main purpose is the exhibition part, which includes a projection room, a cafe-restaurant, accommodation and office spaces with meeting and conference rooms and a panoramic terrace. 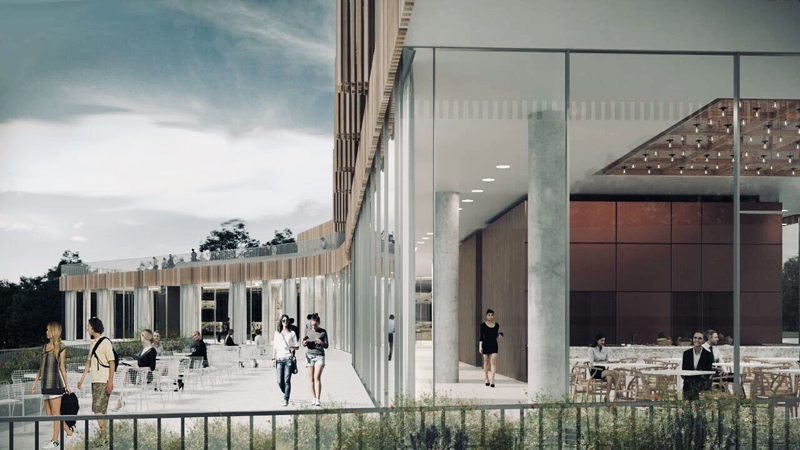 According to the project of the Belgrade Inka studio in our Nature Reserve, the visitor center with its architecture will support the natural environment. At only 40 km from Belgrade there is Obedska bara, the first nature reserve in the world after Jeloustouno which has received a special level of protection of the international natural heritage and thus became the Special Nature Reserve. This nature reserve has been protected since 1874 and is recognized as the most important habitat of birds in the world by many eminent organizations and institutions. In order to promote all the values ​​of the Obedska bara reserve, it is planned to build a new visitor center with a total area of ​​around 3,500 m2. The project bureau Inka studio has made a project which best presents all the natural and cultural values ​​of the special nature reserve Obedska bara. Organically formed two floor units, they interweave each other, thus creating a unique ambient zone. 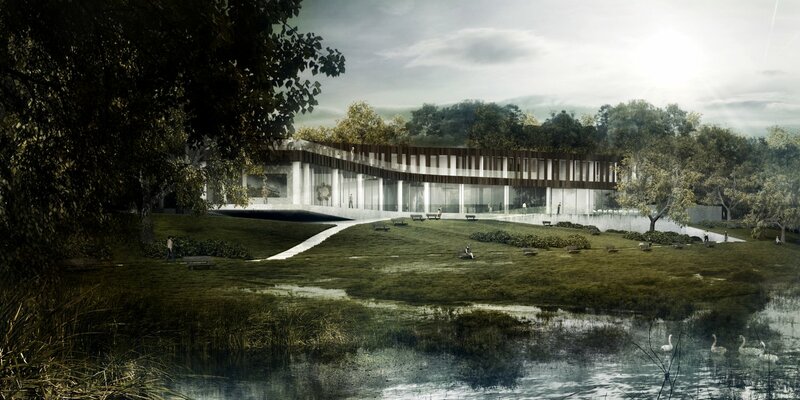 Formal design of the new Visitor Center Obedska bara supports the natural environment of the reserve, making with it a unique whole. Organically formed two floor units, they interweave each other, thus creating a unique ambient zone. A ground transparent airspace extending in three directions is connected with the natural environment, while the upper closed part of the building extends in two directions, partly passing the ground part of the building, thus emphasizing spontaneous natural flows and in architectural design. The façade is designed to achieve a unique connection between the building and the habitat itself. The ground floor is completely transparent and opens the view towards the bars, while the facade of the floor is completely covered with wooden blinds with vertical split, whose opening creates a playful composition of full and empty surfaces. The roof is flat, impassable, and solar panels are projected on it, as a type of sustainable energy source. According to investors' demands, the facility of the Visitor Center is designed as a multifunctional space in which the main purpose is the exhibition part, which includes a projection room, a cafe-restaurant, accommodation capacity and office space with meeting and conference rooms and a panoramic terrace. In accordance with the architecture of the building, the construction has been solved so that the interior space is maximally relieved by the structural elements in order for the object to be as functional as possible, and so that the technological scheme of the visitors, users and employees movements would be logical and at the same time to preserve the aesthetics of the interior. The roof is flat, impassable, and solar panels are projected on it, as a type of sustainable energy source. 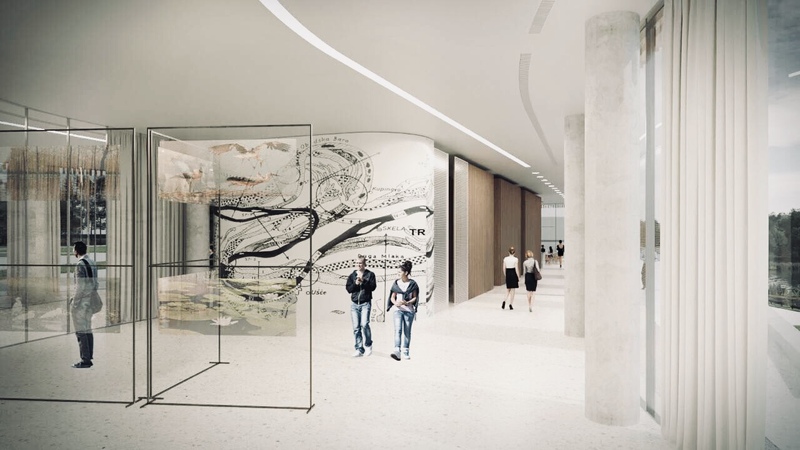 The level of the ground floor is conceived as an open exhibition area with a communication that directs the circular movement through exhibits with a rough gross surface of about 1,500 m2. In the entrance part there is a foyer with info-desk from which it is possible for the tourist groups to direct directly to the exhibition setting or to the lecture room or to the panoramic terrace with spectacles. The exhibition space was made for the needs of a permanent setting towards dedicated separate units - a whole forest, river, bar, cultural heritage. Exhibited units were reconstructed with parts of fixed and movable bulkheads, making the possibility of a flexible exhibition space adaptable to future needs. The exhibition part has direct contact with the nature and environment of Obedska Bar and establishes the connection between the exhibits and the environment of the reserve. The projection hall with a capacity of 56 seats, with its office and projector, is intended for various purposes from projections, to educational lectures. At the end of the exhibit there is a restaurant with a terrace and exit to the park. Within these contents, on the ground floor there are other accompanying facilities such as the souvenir shop located on the main route, at the end of the exhibit the sanitary block, as well as the accompanying kitchen next to the restaurant. The partially inclined terrain to Obedska Bari enabled the provision of space for the storage of catamarans, as well as the necessary technical rooms and storage in the basement part of the building with a gross area of ​​650 m2. At the level of the first floor, a residential part with a business area of ​​approximate gross area of ​​1330 m2 is designed. According to the project task, in the accommodation part, capacity of 4 double rooms, 4 triple rooms, 1 room for people with special needs and 3 apartments were realized. Most rooms have terraces and views of the reserve. From the level of the first floor comes the panoramic terrace of 276 m2, which is intended for sightseeing of the reserve. Accordingly, spectra are projected on the terrace, as well as the accompanying mallard and greenery. The Visitor Center with its architecture supports the natural environment. On the recently completed Kopaonik Business Forum, it was announced that the construction of a visiting center on Obedska bara started. Opening date not published.